Norman Nieto-Nieto, age 30 from Spring Valley, was arrested Saturday morning for Driving While Intoxicated and Operation of a Motor Vehicle with BAC or .08% or More. A Sheriff Patrol Officer observed Nieto operating a motor vehicle on Route 45 in an erratic manner. Upon investigation, it was determined that he was intoxicated. He was processed at Sheriff Headquarters in New City and released on summonses to return to Ramapo Justice Court on April 6. Jay Diaz, 24 of Haverstraw was arrested Sunday morning for Driving While Intoxicated, Operation of a Motor Vehicle With BAC .08% or More and Open Alcohol Container in Vehicle. A Sheriff Patrol Officer observed Diaz operating a motor vehicle on Route 303 in an erratic manner. Upon investigation, it was determined that he was intoxicated. He was processed at Sheriff Headquarters in New City and released on summonses to return to Clarkstown Justice Court on April 17. Andrew Kwapien, age 30 of Plymouth, MA was arrested early Sunday morning for Driving While Intoxicated, Aggravated DWI, BAC .18% or More and Open Alcohol Container in Vehicle. A Sheriff Patrol Officer observed Kwapien operating a motor vehicle in an erratic manner. Upon investigation, it was determined that he was intoxicated. He was processed at Sheriff Headquarters in New City and released on summonses to return to Clarkstown Justice Court on April 17. The Stony Point Police arrested Ronald Babcock, 49 year old male from Newburgh for Criminal Possession of a Controlled Substance yesterday. Following a vehicle and traffic stop, the police searched Babcock’s car when they found him to be in possession of suboxone, a controlled substance in which he did not have a prescription for. He will return to Stony Point Justice Court on May 5. The Orangetown Police arrested Terrence Mulrooney, 43 of Congers for Criminal Possession of a Controlled Substance in the 7th degree and Unlawful Possession of Marijuana on March 25. The defendant was observed operating a motor vehicle in Nyack and was stopped for a vehicle and traffic violation. Upon investigation, officers found Mulrooney to be in possession of alleged marijuana, alleged heroin and a pill alleged to be a controlled substance. He was placed under arrest and transported to headquarters. He will return to Nyack Justice Court on April 20. The Orangetown Police arrested Patrick Hogan, 32 of Pearl River, for Felony Assault in the 2nd degree and Criminal Possession of a Weapon in the 4th on Saturday. It is alleged that Hogan got into a verbal argument with a female victim at a home in Pearl River. The women reported that Hogan threw a glass object in her direction that struck her in the back of the head causing a deep laceration that required treatment at Nyack Hospital. Hogan was processed at headquarters and will return to Orangetown Court on April 10. On Sunday evening, the Orangetown Police arrested Mitchell Heinman, 31 from Nyack, for Driving While Intoxicated. Police received a report of a vehicle accident in Suffern in which one of the vehicles fled. A description of the vehicle was given to the officers by a witness. When the vehicle was located on High Ave in Nyack, they identified Heineman as the driver. The officers observed heavy front end damage to his car as a result of the accident. They also observed a strong odor of an alcoholic beverage coming from his breathe, his slurred speech and his bloodshot eyes. Many sobriety tests were conducted and Heineman failed all of them. He was then arrested and sent to headquarters where he refused a breathalyzer test. He is due back in court on May 2 to answer the charges. Ramapo Police arrested a 39 year-old male driver for Reckless Driving on March 28. The driver committed several traffic and vehicle violations including crossing over a double yellow line, failing to stop at multiple stop signs, passing a stopped school bus without slowing down and also speeding. The driver slowed down when he noticed the police car but it was too late. The Ramapo Police are looking for Isaias Coyoy for Driving While Intoxicated in May of 2015 in Montebello. Isaias is 34 years old, 5’2 and weighed about 185 lbs at the time of the arrest. Anyone with information is asked to contact the Ramapo Police Department as (845) 357-2400. The Suffern Police arrested a 35 year-old man for Criminal Mischief and Harassment following a domestic dispute. The man allegedly damaged property that belonged to another family member. Marvin Louissant, 17 and Raymond Perez, 18 were charged with 2nd degree Assault and 1st degree Criminal Possession of a Weapon on Wednesday. Police responded to Rose Ave for reports of gunshots around 6 pm Friday. Officers found a young adult male with a gunshot wound in the leg area. The young man was transported to the hospital and was treated for non-life threatening injuries. The two were taken to jail and are pending future court dates. Devon Lawson, 19 of Chestnut Ridge was arrested on March 29 for Assault, a misdemeanor. Lawson was allegedly involved in a physical altercation that occurred at a house party in Pomona last year. He will return to court later this month. Clinton Anderson, 37 year-old male from New City was arrested on March 31 for Assault, a misdemeanor. Anderson was involved in a domestic dispute in Haverstraw on that same date. He was held on bail to appear in court later this month. Carvin Gilot, 27 year-old male from Thiells was arrested on March 27 for violating a court order, a misdemeanor. The court order that was ignored by Gilot stemmed from an ongoing domestic dispute. He was held on bail and will return to court later this month. Romeet Miller, 37 year-old from Haverstraw, was arrested on March 30 for driving with a suspended license, DWI and leaving the scene of a property damage accident. He was held on bail and will appear in court later this month. 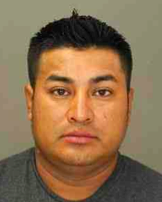 Jose Acevedo-Herrera of Newark, NJ was arrested on April 1 for being a fugitive from justice. He was stopped for a traffic violation on Broadway in Haverstraw and revealed he had 3 active warrants on him in NJ. One of the warrants was for Burglary. He is being held in Rockland County Jail and is waiting on his extradition to NJ.